I’m a thirtysomething creative generalist, freelancing since 2011. I mostly work as an interior designer, but also enjoy food styling, (graphic) design and any social impact project. I’ve worked for architecture studios, retail shops, web shops and so on. I’m also a proud mom and my 6 year old daughter gives me a lot of inspiration. There are 3 things that really shaped who I am today: The move to France when I was 5, discovering art on family holidays and the core values my parents thought me. When I was 5 years old, me and my family moved to France. Growing up there until I was 10 really defined the person I am today. I love French culture, food and off course the language. I became bilingual and that proved to be a big advantage in life especially in Brussels. It took a while before I could consider Belgium as my home once we got back. The love for France was strong, but Belgium became my ‘new home’ when I got older. My favorite part by far is Brussels. Although we don’t live far, my husband and I recently decided it’s time to move to our favorite city. We’re looking at houses in Brussels as we speak. Moving around when you’re young, teaches you how to adapt quickly to different situations. You learn to trust the magic of new beginnings and to be flexible. Being introduced to art and architecture at a young age, shaped me as well. On holidays, my parents took me and my four(!) siblings to unusual places all around Europe to visit heritage sites and museums . Although we preferred playing on the beach more at the time, this made us aware of art in the broad sense. I can’t thank my parents enough for that. Lastly, at home there was a strict ‘no selfish behavior’ rule. As we were a big family, sharing was a core value. We learned to share not only with each other but also with anyone who needed help. They motivated us to get engaged in social projects and charities. It made me a socially engaged person. I do multiple ‘pro bono’ projects every year as interior architect or graphic designer. I find it important to give back. I’m always committed for 200%.I’m looking for positive collaborations and genuinely nice people. Collaborations should be interesting, inspiring and positive. Off course there will always be unexpected or difficult moments but I am really grateful I got to that point now where working is mostly pleasant and meaningfull. Anyone who likes spending time in Brussels. When you like Brussels, Brussels likes you too. There’s such a big diversity of people and it feels like Brussels is saying: “You’re here, just be who you are, it’s OK” So for me, that’s a Ketje: someone who stays true to him or herself and appreciates the many imperfections of Brussels and people in general. Being modest, having great work ethics and on the negative side maybe being too hard on themselves. People should loosen up a little bit more. Just have fun. I have a tattoo that says ‘Et Alors’, that should be everyone’s slogan from time to time. Stromae: for his ability to bring all Belgians together no matter what background and for his amazing style and creativity. His show at Rock Werchter a few years ago blew my mind. I loved the scenography and the energy. 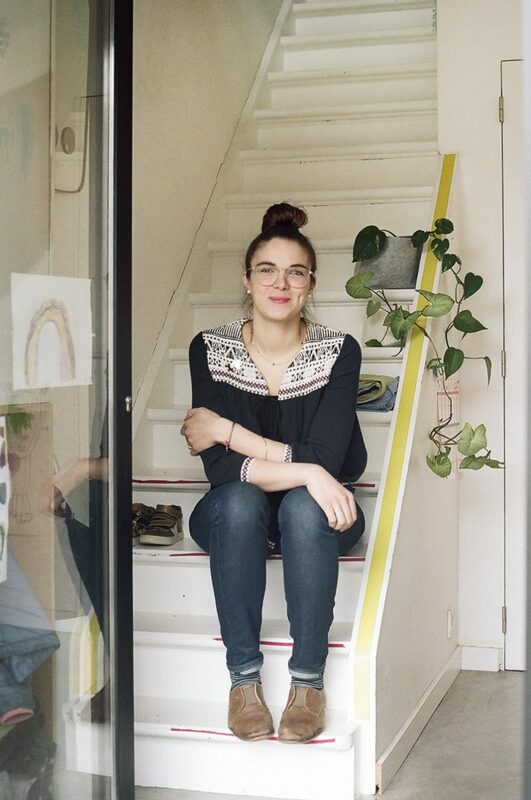 La fille d’O’s Murielle Scherre: for being the awesome mission-driven creator that she is, and for celebrating Belgian craftwomanship. She changed the way I feel about my body and she’s a great inspiration. She empowered me to live my life the way I want it, no matter what other people think. She’s an all-round great person too, to top it off. Kobe Desramaults – his bread is genius, De Superette in Ghent is amazing and his cooking is the best. I love his rock-n-roll attitude. I would start at Le Palais de Balkis in Molenbeek for breakfast, then take a stroll towards the MIMA museum because it’s an amazing project with inspiring exhibitions. Both of my sisters lived in that neighborhood for years, so I got to know it pretty well and I love it there. Next stop: share a pizza at La Belle Équipe, get just enough fuel to walk your way through the city center and Rue de Flandre/Vlaamsesteenweg towards the first ‘aperitif’ stop at Mer du Nord/Noordzee. Maybe add some seafood if you’re into it. I would always say yes. After aperitif comes lunch, my favorite place is definitely Les Filles. In the afternoon I would take them to BOZAR or WIELS, two historic institutes with impressive exhibitions. To end the day we would eat French fries on the way to the Atomium. I love the way it was renovated, especially its night lighting. Because we constantly think we need to do better!